This is my second post today. 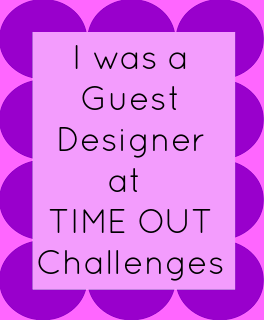 If you are looking for my Time Out Guest Designer post, please scroll down or click here. Where did April go? I have no idea. 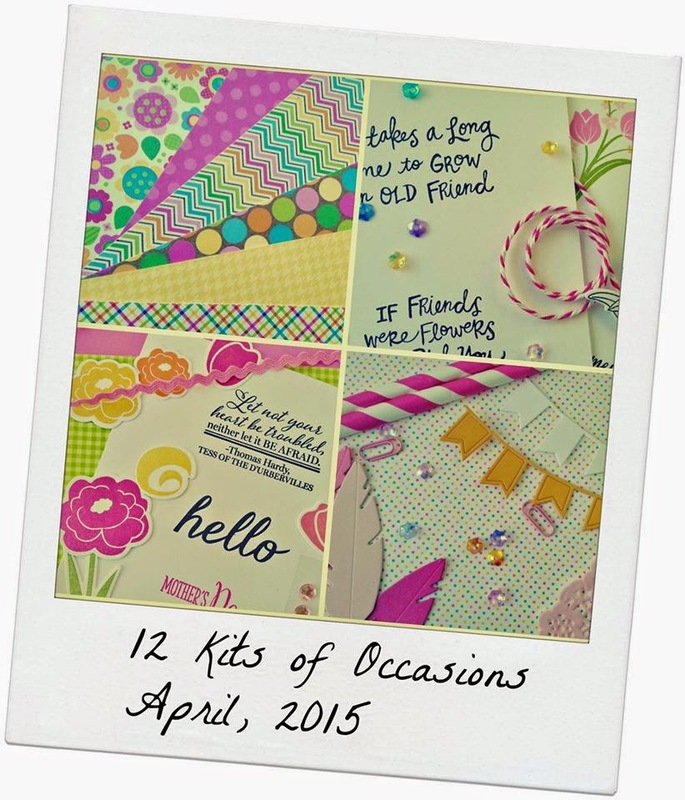 But, as we say goodbye to April, it is time to reveal my creations for our monthly 12 Kits of Occasions. Our host this month is Tracey McNeely of In My Creative Opinion and her theme is 'Tickled Pink'. She sent us a beautiful kit, chock full of all sorts of pink goodness. I fell in love with every element of this kit, and before I knew it, I had created 7 cards. Here is a picture of the kit Tracey sent to all of us. I am going to get right to my cards. I am entering this card at The Challenge #32 to use Polka Dots. I used some of the patterned paper Tracey sent to make my pink polka dotted clouds. 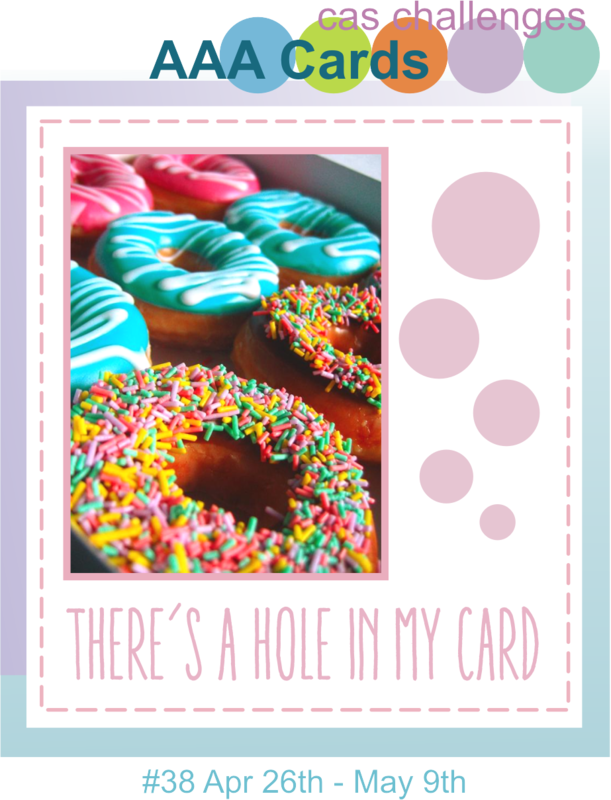 I used the sketch at Sweet Sunday Sketch #266 for this card. I am entering this card at Simon Says Monday Anything Goes. I am entering this card at AAA Cards #38: There's a Hole in My Card. I am entering this card at Simon Says Wednesday Anything Goes. 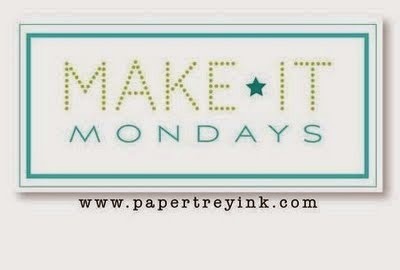 I am entering this card at Make it Monday #210: Using Vellum to Soften Patterns. That's it for me this month. As usual, I ran out of time way before running out of supplies or ideas. A big THANK YOU to Tracey for such an amazing kit. I loved everything about this kit, and it was so easy to work with. Please head over to our 12 Kits of Occasions blog to see a list of team members along with links to their blogs. 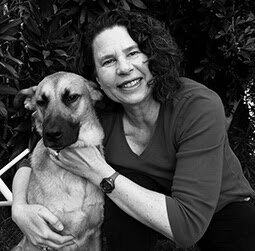 You can also see this month's supply list as well as our special Guest Designer for April--here is a hint--she is 12 Kits alumni and we are so happy to welcome her back with us this month. Hello Hello!! I am so very happy to say that I am a Guest Designer this week at Time Out because I won their black and white with a splash of color with this card (third one down). 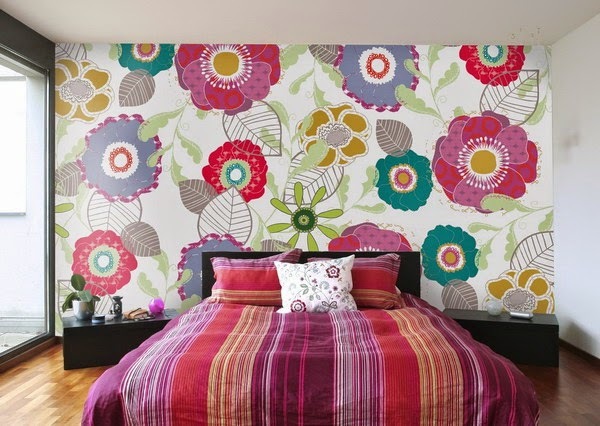 Our inspiration this week is 'Home Sweet Home' and we have this bright and beautiful inspiration photo to work with. I just loved this photo. I was inspired by that wall paper, and so used Waltzingmouse Funky Flowers stamps to create my own bright and vibrant background. 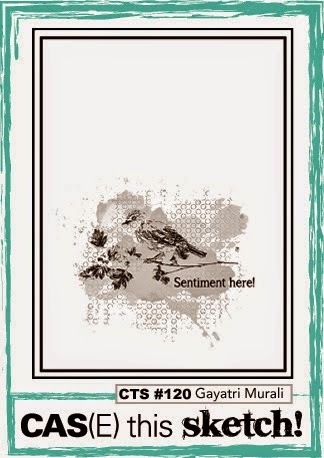 I split my panel with a stitched Lawn Fawn die to provide a space for my sentiment, after impressing the entire card front with the Burlap Impression Plate. 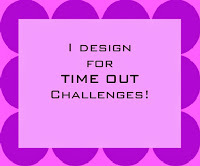 I hope you will play along with us at Time Out this week. Hello and happy Tuesday. It's time for another challenge at CASology. 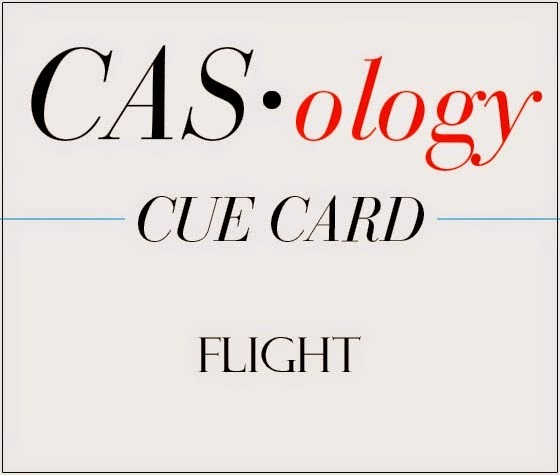 This week, our cue word is FLIGHT. I decided to break out my new Altenew Painted Butterflies set for the first time and played around with the different images in the set. There are so many different ways you could go with this cue word. I am excited to see how you interpret it. 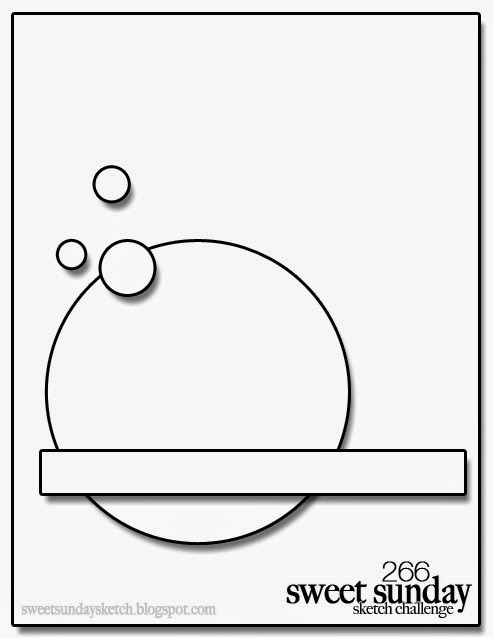 I am also linking this card up at CAS on Sunday where the theme is white and one other color. Here is some bonus inspiration because I was still playing around with Painted Butterflies. I'm entering this card at Simon Says Monday Anything Goes. So, what do you think? Will you play along this week and make something inspired by the word FLIGHT? Please remember to keep your card Clean and Simple. 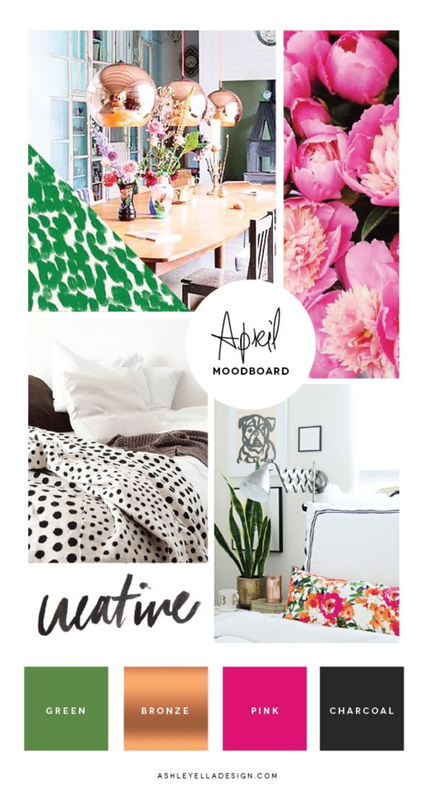 Head on over to the CASology blog and gather some inspiration from the design team. Hello and happy Sunday. I hope you all had a nice weekend. Mine was crazy busy yesterday, getting Rachel all ready for her prom. Today has been much quieter, with time to make some cards. First up is a card using Clearly Besotted Flight of Fancy (for the first time). I inked the largest butterfly up with a Kaleidacolor Caribbean Sea ink pad. As I was following the sketch from CAS(E) this Sketch #120, I stencilled an area for the butterfly to rest using a Dreamweaver Mesh Stencil and Weathered Wood Distress ink. 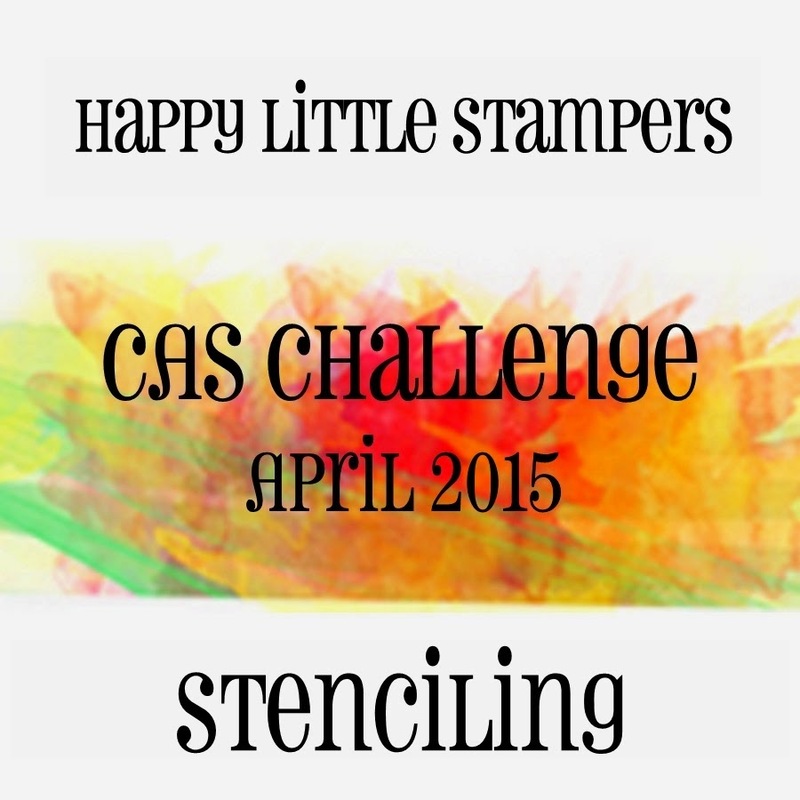 I am also entering this card at Happy Little Stampers Stencil challenge. Another butterfly, this one from PTI Life is Beautiful, inspired by the beautiful sample at Muse #114. I must confess to sticking pretty close to the original, as I could not see any way to improve it. 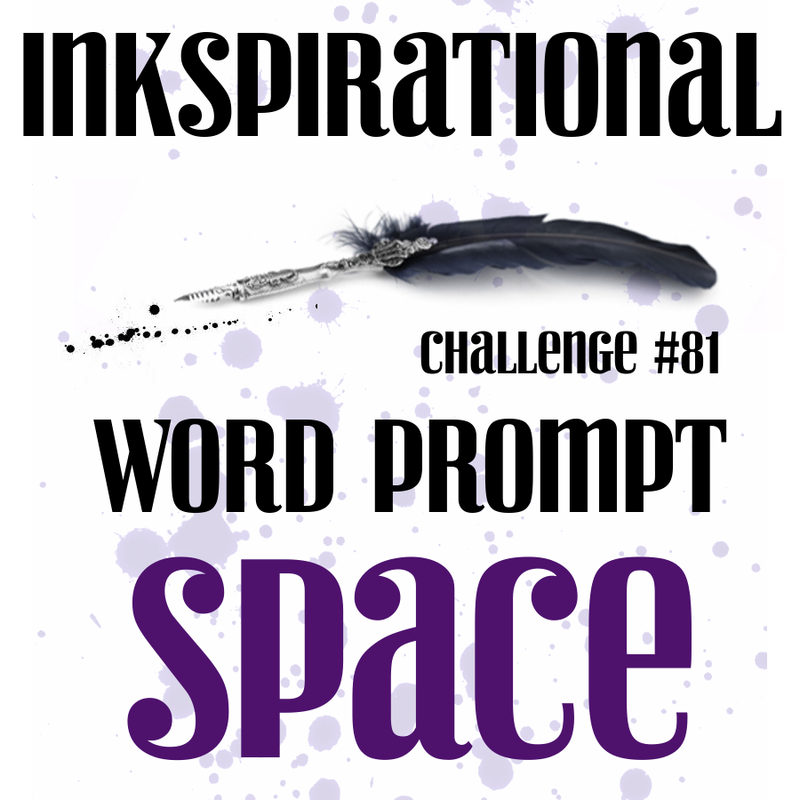 I am entering this card at Inkspirational #81: Space. 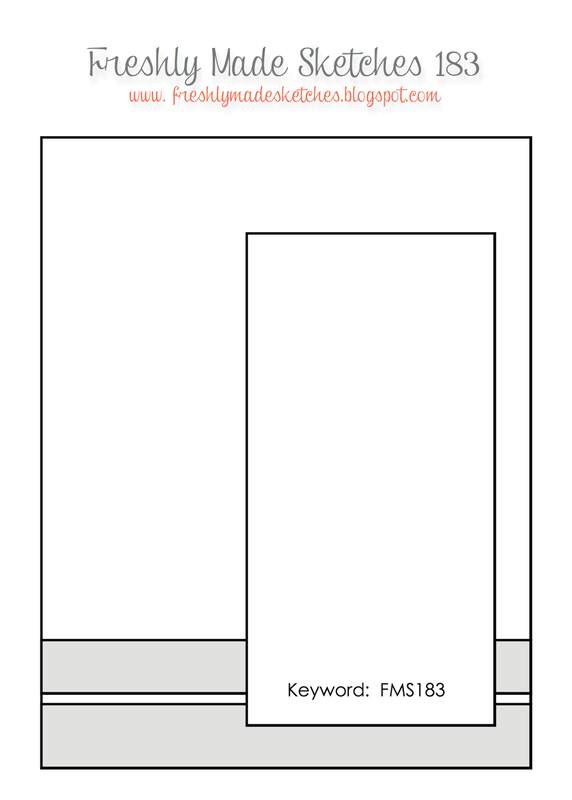 I am using the negative space in the lavender rectangle with my butterfly and Seize the Birthday without toppings. I am entering both of these butterfly cards at Uniko #20: Things with Wings. My last card for today uses the sketch at Freshly Made Sketches #183 and is inspired by the colors and graphics at the Ellen Hutson Pinsights Challenge. Finally, I will be entering all three of these cards at Addicted to Stamps and More #141: Anything Goes and Simon Says Wednesday Clean and Simple challenge. Today I am playing along at the April PTI blog hop, where we were given this beautiful inspiration photo. 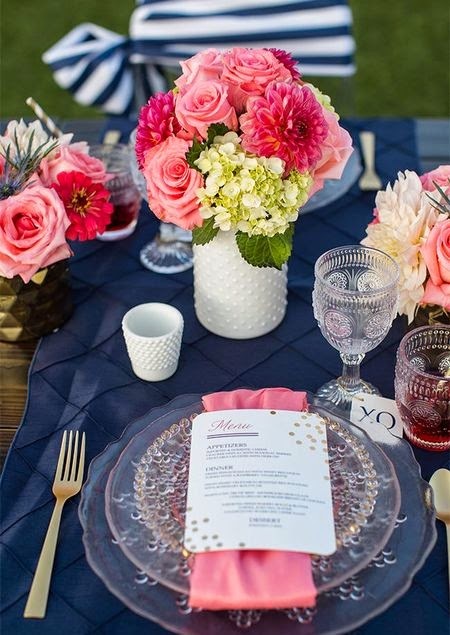 I was inspired by the navy and white stripes in the back of the photo and those gorgeous pink roses. If you look closely, you can see the WOS and rain stones on the flowers. I am also linking this card up at Addicted to Stamps #141 Anything Goes and Simon Says Stamp Wednesday Clean and Simple. Happy Wednesday. I am here to post a few cards I made over the past several days. First up is a card using the techniqe from this week's Make it Monday #209: White on White Die Cuts with a Pop of Color. One of the take aways from this week's lesson is about choosing what die cuts will work with this technique. The image should be recognizable even without the stamping on top. I chose to work with one of the popsicles in Summer Sweetness. I think those popsicles are pretty easy to see, although the pink one is definitely the most scrumptious-looking. You can almost see the WOS in the photo. I am also entering this card at Simon Says Wednesday Clean and Simple Challenge. 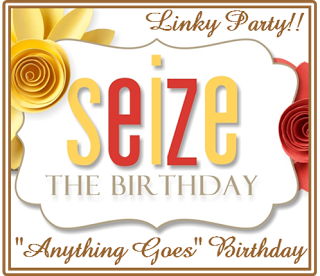 Better late than never...I am sending birthday wishes to a very sweet friend, Monika, who is hosting a birthday linky party. The challenge is to CASE one of her cards, and she was even kind enough to point out her favorites. 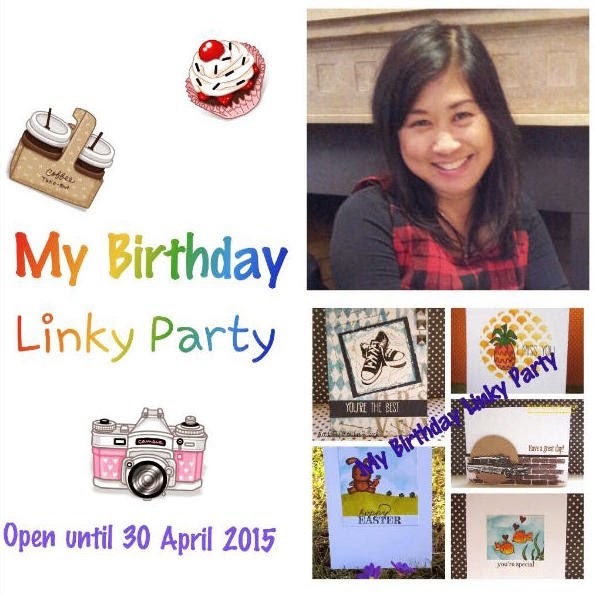 I CASED the card in the lower right corner of her linky party graphic. It is a little hard to tell, but I cut a square out of computer paper and used it as a mask for my big dahlia stamp from SU Regarding Dahlias set. I just love that image, and I hope Monika will love it too. 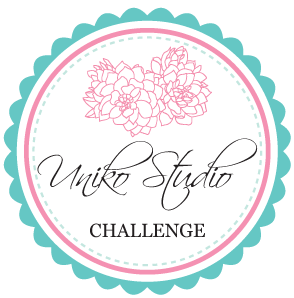 I am also linking this up at Simon Says Monday Due Date challenge. Even though my card is past due, the birthday wishes are sincere. The challenge at Time Out #29 is "You can't make a rainbow without a little rain" Well, I beg to differ. We are in a terrible drought in California and so have no rain. BUT, I was able to make a rainbow anyway, thanks to PTI Rainbow Stripes dies. Yay for dies saving the day. (If only we could water our plants with dies....) I was inspired by this card by Lisa on I'm in Haven. 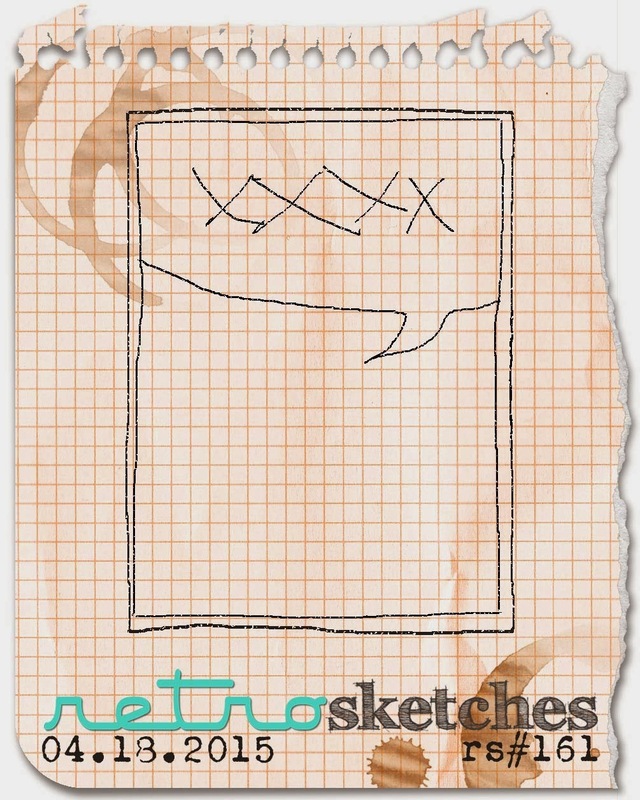 Last up is a card inspired by the sketch at this week's Retro Sketches #160. I cut into a sheet of Happy Home paper by Bella Blvd. to make a new home card. (Don't worry, I still have a pristine sheet of this paper for hoarding purposes). I am also linking this card up at Addicted to Stamps and More #141 where the challenge is Anything Goes. That's it for me today. Enjoy the rest of your week.